One of the most exciting developments in the area of health and wellness over the past decade has been the recognition that gaining an understanding of a person’s uniqueness opens the door to far more effective strategies for management of disease risk and treatment as well as health preservation and enhancement. This empowering perspective has been termed personalized medicine, and it incorporates a vast array of information sets including genetics, standard laboratory assessments, and even information gleaned from studies of a person’s gut bacteria to ultimately tailor a dedicated and specific program for the individual. To be sure, “women’s health” as a medical specialty has clearly become well, if not somewhat narrowly, defined. Typically, the term embraces those issues unique to women and overwhelmingly focuses on the reproductive process. More recently, there has been recognition that while rates for conditions like cardiovascular disease, cancer, and lung disease are similar between men and women, the disease course and response to treatment may vary considerably. These observations have helped to broaden the understanding of the uniqueness of women’s health well beyond reproduction and sexuality. Clearly, however, there remains a paucity of acceptance that significant differences exist when comparing the brains of men and women in terms of function, disease risk, and response to treatment. Why this lack of recognition and its acceptance remain pervasive is beyond the scope of this foreword, but it’s certainly not a consequence of inadequate scientific support. Decades of research clearly demonstrate that females are at less risk for a variety of brain disorders including autism, attention deficit/hyperactivity disorder (ADHD), Tourette syndrome, and dyslexia, but have higher risk for multiple sclerosis, depression, anxiety disorder, and anorexia nervosa. Indeed, a woman’s risk for Alzheimer’s disease, a disease for which there exists no meaningful treatment whatsoever, is double that of a man’s, a statistic that receives precious little mention in the media. There are a multitude of factors at play that contribute to the brain’s gender differences, many of which are influential during development. These include fundamental female/male genetic differences as well as variability in terms of how hormonal and environmental influences are operant depending on gender. Hormonal and environmental influences have a direct bearing on brain development as well as secondary effects through the mechanism of altering gene expression. These and other mechanisms, and their unique gender-related manifestations, persist throughout our lifetimes and impart measurable differences in the brains of women in comparison to men in terms of structure as measured by sophisticated imaging technology. How these physical differences influence physiology, function, and behavior is central to an emerging body of research. But despite a full understanding of these mechanisms, many important brain-related issues that challenge women are remarkably responsive to modification of lifestyle choices. In the pages that follow, Dr. Sara Gottfried unpacks the science that clearly supports the heretofore politically incorrect notion that men’s and women’s brains are different. She deftly explores how these differences manifest in many of the pervasive issues that plague modern women including forgetfulness, weight gain, addiction, depression, anxiety, and exhaustion, and how fundamental the brain/body connection is to overall health and well-being. This connection between brain and body is further explored in the context of conditions like digestive disorders, fluid retention, and chemical sensitivity. But the true blessing of this work is the actionable plan that builds on this science and paves the way for recovering optimal health. 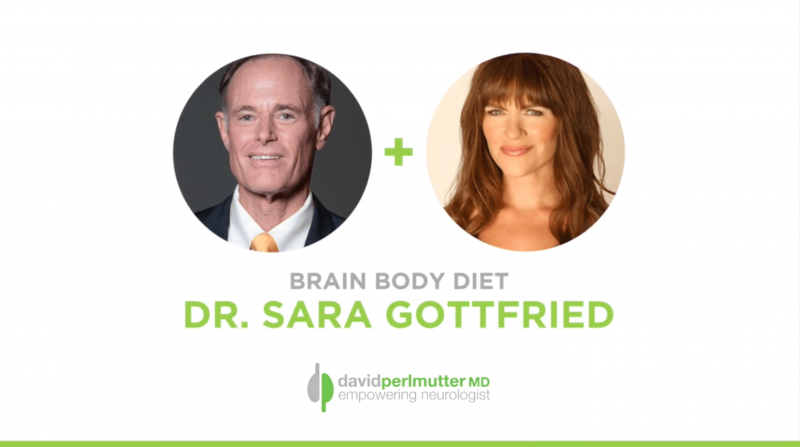 The Brain Body Protocol that Gottfried has created provides a powerful, user-friendly program allowing readers the opportunity to leverage the knowledge Dr. Gottfried presents to bring about a long-awaited, positive change in health destiny—for all women. The above is excerpted from BRAIN BODY DIET: 40 Days to a Lean, Calm, Energized, and Happy Self by Sara Gottfried, MD. Copyright © 2019 Reprinted with permission by HarperOne, an imprint of HarperCollinsPublishers.